The thrill of antiquing stems from not knowing what secret gems you will uncover, and never is that more apparent than in Florida. Whether you’re looking for pieces to refinish and make your own or something exotic and unique, our favorite shops will surely have some of the most intriguing antiques The Sunshine State has to offer! With over 100 one-of-a-kind shops and stalls, you'll find some of the most versatile antiques here at an affordable price. With everything from industrial pieces to vintage antiques, there truly is a treasure here for everyone. This antique market even has its own garden shop for those looking to spruce up their front or back yards. Looking to liven up your beach house or bring some nautical style to your inland home? Check out Stone Age antiques in Miami. They specialize in all things nautical, from cannons off of Spanish war ships to see sponges. Many moviemakers are known to come here to rent or buy unique props! The founder of the store, John Washburn, has been traveling across the globe since 1997 to discover the pieces you'll see in the Washburn Imports show room. 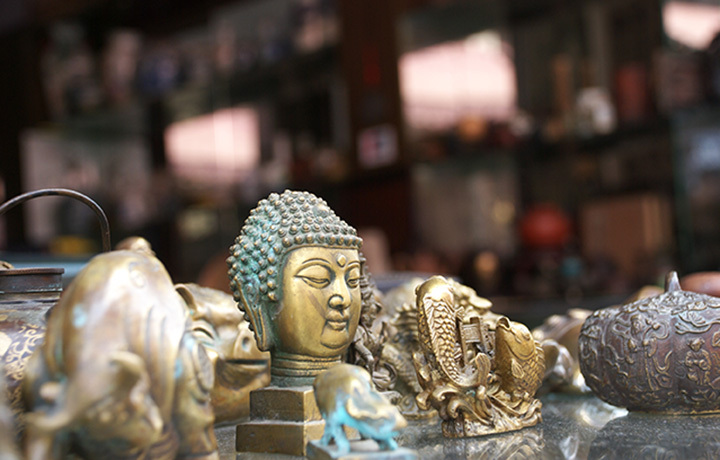 Located in Orlando and Sanford, you'll find the most exotic treasures in this antique shop. If you're looking for authentic pieces in the Central Florida area, stop by The Mill to browse through their rustic, mid-century and industrial antiques. With the help of their consultation team, you even have the option to design custom pieces both small and large. All four Adjectives Market locations will “wow” you with their creative gifts, rustic antiques and fashionable accessories. Covering over 50,000 square-feet between all their locations, it's easy to spend hours in their spaces admiring some of the best antiques in the state. Boasting a remarkable collection of 17th to 20th century antiques, this charming district is where you'll find more than 40 shops. They offer modern, period deco, vintage pieces and more to their patrons. Miles’ 65,000-square-foot show room is one of the most striking in the state. Showcasing antiques from over 700 vendors local to the area, you'll find the perfect gift for a friend or a treasure for yourself. Check their website for special events! Located in the downtown historic district of Arcadia, you'll find 20 unique antique shops as well as restaurants to enjoy here! On the fourth Saturday of each month they host an antique fair, which is known to impress locals and travelers alike. Antiques and Uniques houses a wide variety of home decor, furniture, industrial salvage and much more. They're known for great prices and pieces you won't find anywhere else! Adding new pieces to their collection daily, Webb’s is a go to if you are looking for antiques in the Lake City area. This hidden gem is where you'll find collectibles, vintage pieces and many other special items.